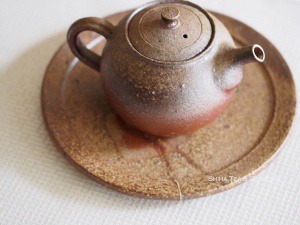 This is guide for Japanese handmade teapots and tips of how to select. 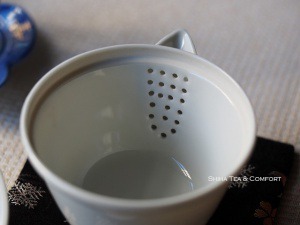 Japanese teapots have a strainer (filter) inside. 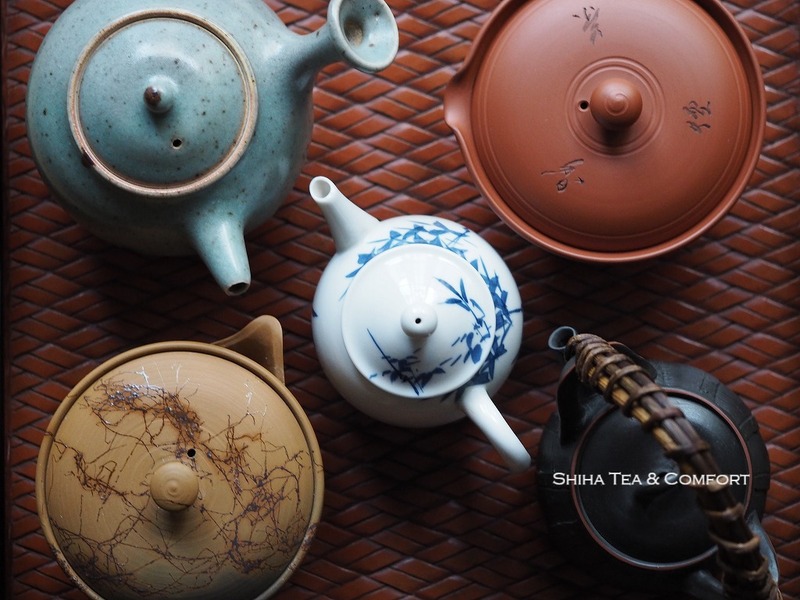 Shiha Tea & Comfort specialize in high-end teapots – that have a ceramic / porcelain strainer inside. Lower price teapots have stainless strainer mounted inside. 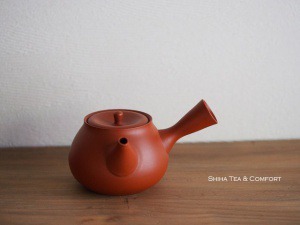 Teapots on this page are Shiha Tea & Comfort’s collections. 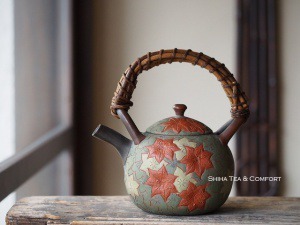 Enjoy beautiful, traditional, handmade Japanese teapots. 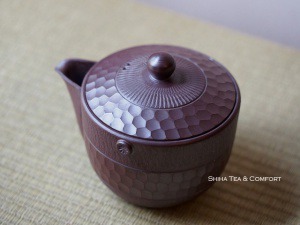 Typical Japanese Teapot Style. A handle and a spout placed slightly smaller than 90° angle. “Standard” (most common) size is 250-330 cc capacity. Much bigger than average size of Chinese teapots. 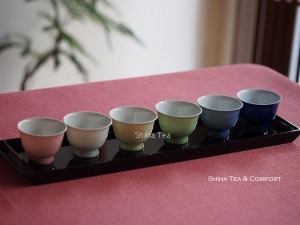 You can brew any kind of tea like green tea, white tea, oolong tea, black tea, Pu-er tea, herb tea. 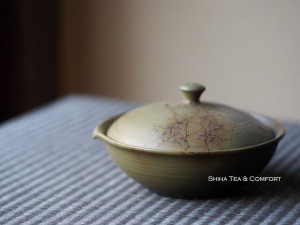 Shiha Tea & Comfort carry smaller size of Japanse teapots (130-230cc) as well. 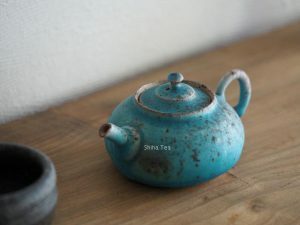 I personally use small teapot often for brewing Chinese Tea and brewing strong Japanese green tea. 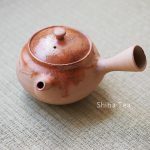 I wold say that red clay and purple clay teapots with no glazing are traditional, and most popular among Japanese people until recent years. 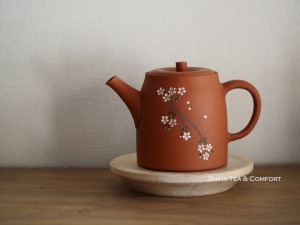 I also use red clay teapot in this picture. Traditional, simple, 200cc, good clay, fine work，just lovely. There are also porcelain (grazing) , ceramic (glazing), copper side-handle teapots. 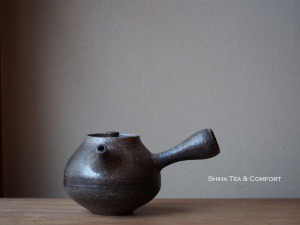 I can say that more than 90% of handmade teapot in Japan is side-handled. 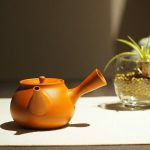 If you are left-handled, it may be difficult to use with this side handle teapot – it is designed to hold with right hand. But there are also ones for left-handled people, but very few. No handle, with strainer inside. This type is called Houhin in Japanese. “Shiboridashi” in next section looks the same, but it doesn’t have a strainer inside. Houhin is usually small, 80-160 cc mainly. They are designed to brew Gyokuro and high grade green tea. It is to enjoy deep/concentrate tea with small amount, some times just a few drops. 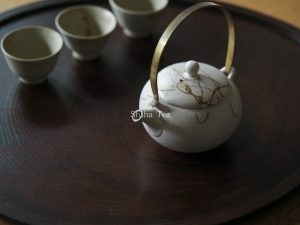 Those tea leaves require low water temperature 65-85 ℃ for infusion, sometimes much more lower. It means that teapot cannot be too hot to hold even without a handle. 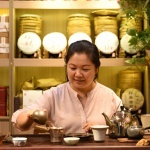 Some Houhin has small holders like ears, if you hold well with your fingers on the holders, high temperature water can do as well, it means any kind of tea leaves can be brewed. Nowadays, bigger size are also seen. Consider required temperature of tea leaves you brew and select. It is better you hold one that you are going to buy with your own hand imagining if it hot. It is also important to check if it fits your hand. Some Houhin can be too large (diameter) to hold for your hand – In this case, your hand get too tense and lose elegance of movement to brew. 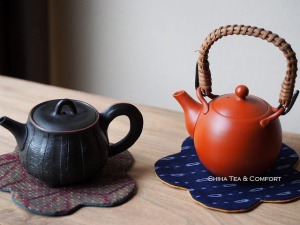 Lid of Houhin is larger, you can watch and enjoy tea leaves in teapots – Houhin is for high grade tea leaves – you can also enjoy color, shape, softness, aroma of tea leaves before and after steeping. 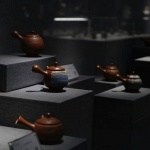 Porcelain works are seen more comparing to other type of teapots. 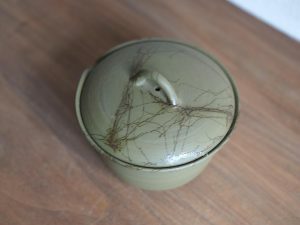 Remember, heat conductivity of porcelain is high – it is for Gyokuro with 50-65 ℃ ideally, otherwise put only less than half water in it , in case your tea leaf require high water temperature. 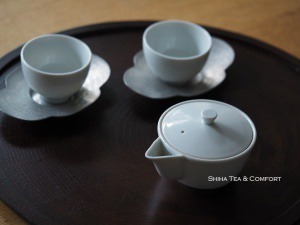 Usually smaller cups are coordinated with Houhin. Gyokuro is tea that we only take small amount e.g. 15-20 cc a time. No handle, without strainer inside. This type is called Shiboridashi in Japanese. 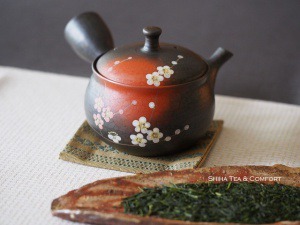 This is also designed to brew Gyokuro and high grade green tea, which low temperature water is used for brewing. If you would like to brew your tea e.g. 95 ℃ with Shiboridashi，when buying, think about if you can hold it properly without burning your hand. 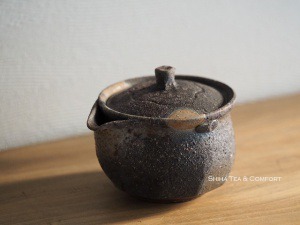 Shiboridashi is not seen so much, it is special teapots even for Japanese so that many of Japanese people may not know the name unless tea lovers. 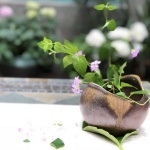 It is the same as Houhin, using Shinoridashi, we enjoy drops of green tea, usually less than 20cc for a person with small cups (see picture) – It is Japanese traditional brewing. However what tea brew is up to you. 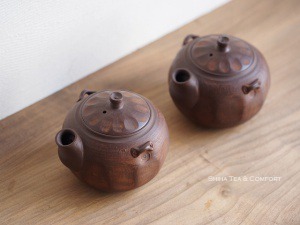 I am glad to hear news how you match Japanese teapot and tea leaf. At season of fresh tea leaves, I visit tea farmers. They steep freshest tea using Shinoridashi for me. 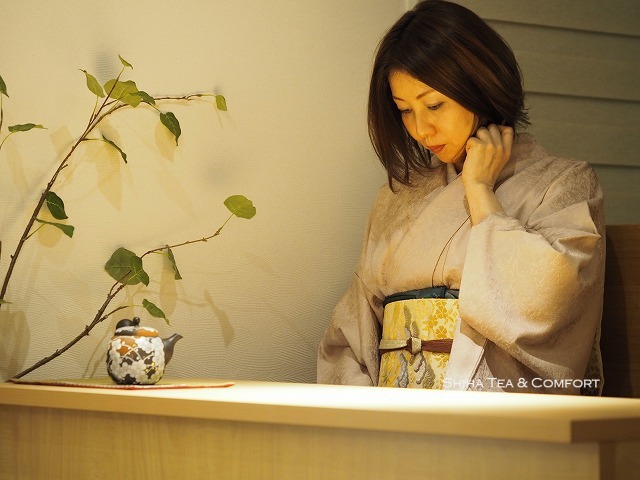 I enjoy watching tea leaves being prepared in it, waiting quietly. 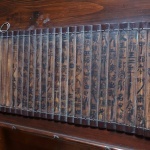 Personally, Shiboridashi is connected to the image. 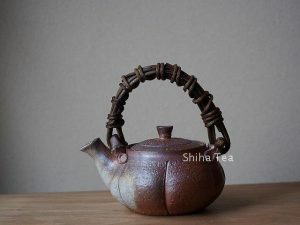 In Japan, “handmade” back-handle teapots are relatively not produced so much, especially smaller one. Many of back-handled are bigger (250-400 cc) . 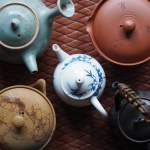 Those big teapots, we, Japanese no longer call as “kyusu”, we call it “teapot (ティーポット)”. 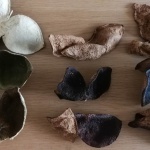 Smaller (130-200 cc) handmade back-handled are (only (exaggerating)) selected by tea enthusiasts. This is the reason why handmade back handle small teapots are not seen so much, I assume. 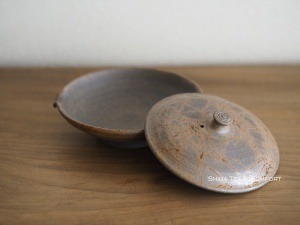 Small back-handled teapots make ordinary Japanese people imagine Chinese Tea. 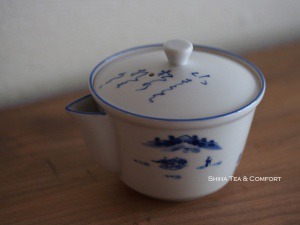 Bigger back-handle porcelain teapots are for black tea and herbal tea in many people’s mind. (Probably people who were born before 1980). Actually you can brew any kind of tea with back-handled, of course. When selecting, hold it with imagining full water in it, make sure if your finger and hand should feel comfortable with the handle and weight. Bigger capacity can be too heavy/tense to hold in case handle is too small. The best is actually put full water and hold, if it is allowed. 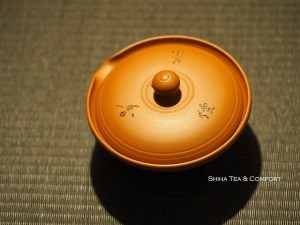 Lid of Japanese teapot is not like Chinese one, it is so to say flat. 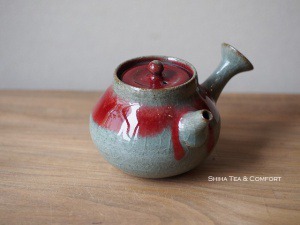 Some of our Chinese customers reported that they dropped a lid on the floor when poring (it was broken – customer and I both were sad) because lid of Chinese teapot stays on teapot even sharply tilting. So please be careful when poring. There are some technique to hold lid, use finger or put your other hand on the lid. 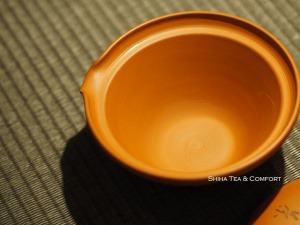 For reference, we call this shape “teapot”, not “kyusu”. It is not only matter of size, shape can decide how it is called. 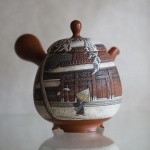 Upper handle teapots used be seen widely some decades ago in Japan. Material of handle can be rattan, bamboo, metal, the same material as its body. Dobin is upper handle, big, ceramic or porcelain. If someone tell me, “I want to buy a Dobin”. I have to ask ” to brew tea or to boil tea/herb?”. You need to make it clear how you would like to use. Some Dobins don’t have strainer inside. There is just a hole inside connected to spout. You need to make sure the followings to use properly. If clay of Dobin is not fireproof, it will crack or broken if put over fire. Please be careful. 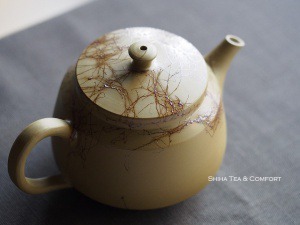 If you would like to learn about Japanese teapots, we can hold a seminar for you. Please contact us.